Bhutan is a unique country both culturally and environmentally. Perched high in the Himalaya, it is the world’s last remaining Buddhist Kingdom. It has developed the philosophy of Gross National Happiness; where development is measured using a holistic approach of well-being, not just based on gross domestic product. It is still termed as a third world country with subsistence farming practiced in much of Bhutan. In broad terms, the land is fertile and the population small. In addition, the current generation receives free education, and all citizens have access to free, although rudimentary, medical care. The sale of tobacco products is banned and smoking in public areas is an offense punished with fines. While traditional culture has been very well preserved, the opening of the country to TV and internet in 1999 has had a major effect, and modern-day culture is mostly centered on bars and snooker halls. As a result, there is very little or no evidence of quality contemporary art, theatre or music. Because of the danger of their distinct culture being overwhelmed by Hindu Nepalese immigrants—as had happened in neighboring Sikkim, which ended up being annexed by India—some of whom had been in Bhutan for generations, many were expelled or fled as stateless persons to refugee camps in Nepal. This ideology was the brainchild of King Jigme Singye Wangchuck who, having gained a modern education in India and the UK, realized that mere economic success did not necessarily translate into a content and happy society. Consequently, soon after his coronation in 1974, the young king began to float the idea of developing a new set of guidelines by which to govern the country. Slowly these ideas took shape, and in 1998 the GNH indicator was established. GNH stands for "Gross National Happiness" and is defined by the following four objectives: to increase economic growth and development, preserve and promote the cultural heritage, encourage sustainable use of the environment, and establish good governance. While the concept of GNH receives much international praise and is a major draw for tourists, potential visitors should be aware that the idea is very much in its incubation stage, and there is very little evidence of GNH in the country itself. On 19 July 2011, 68 countries joined the Kingdom of Bhutan in co-sponsoring a resolution titled “Happiness: Towards a holistic approach to development,” which was adopted by consensus by the 193-member UN General Assembly. In follow up to the resolution, the Royal Government of Bhutan convened a High Level Meeting on “Happiness and Well Being: Defining a New Economic Paradigm” on 2nd April 2012 at the United Nations headquarters in New York. This meeting initiated the next steps towards realizing the vision of a new well being and sustainability-based economic paradigm that effectively integrates economic, social, and environmental objectives. Following this resolution, Bhutan continues to be a champion of the resolution and actively promotes the concept internationally. The first humans probably arrived sometime after the Ice Age, and little is known about Bhutan's prehistory. Historical records began with the arrival of Buddhism in the 7th century, when Guru Rinpoche (Padmasambhava) visited Bhutan and established monasteries. In December 2006, King Jigme Singye Wangchuck transferred power to his oldest son, the Crown Prince Jigme Khesar Namgyel Wangchuck, bestowing upon him the title of the fifth Druk Gyalpo. The official coronation took place in November 2008. The Fifth King is Boston and Oxford educated and is held in high esteem throughout the country. It is not possible to travel far in Bhutan without seeing images of a man wearing a tall elaborate hat and with eyes that are open wide and staring forward into space. This is the great 8th century sage of Vajrayana Buddhism, Padmasambhava or Guru Rinpoche as he often called. According to legend, Padmasambhava was reincarnated into a lotus blossom as an eight-year-old child, and from very young he possessed great wisdom and insight. Furthermore, he had mastery of the elements and so like a potter manipulating basic clay and turning it into beautiful pots, he was able to transform harmful action and substances into something positive and beneficial. Guru Rinpoche's special association with Bhutan began when he traveled to the town now known as Jakar at the invitation of a local king to subjugate negative forces. The mission was a success, and from this encounter, Buddhism spread throughout the land. A body print of the great sage exists to this day at Kurjey Lhakhang in Jakar, and he is also associated with many other sacred sites in Bhutan, with perhaps the most notable being the cliff-hanging Taktshang Monastery in Paro. Although geographically quite small, Bhutan’s weather varies from north to south and valley to valley, mainly depending upon the elevation. In the North of Bhutan on the borders with Tibet, the country is perennially covered with snow. In the western, central and eastern Bhutan (Ha, Paro, Thimphu, Wandue, Trongsa, Bumthang, Trashi Yangtse, Lhuntse) you will mostly experience European-like weather. Winter lasts here from November to March. Punakha is an exception as it is in a lower valley and summer is hot and winter is pleasant. 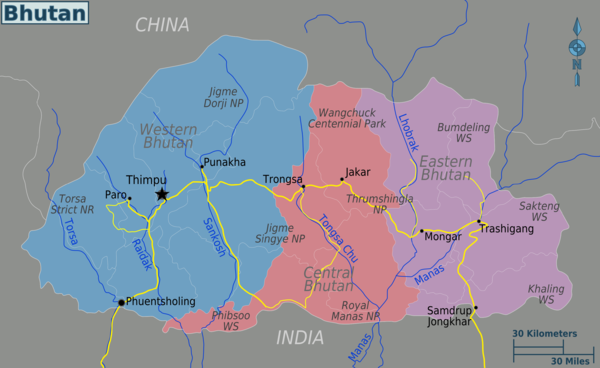 Southern Bhutan bordering with India is hot and humid with a sub-tropical climate. While the monsoon affects northern Indian it does not command the same influence in Bhutan. Summer months tend to be wetter with isolated showers predominately in the evenings only. Winter is by far the driest period while spring and autumn tend to be pleasant. June 4 (not fixed) - Commemoration of Lord Buddha's Parnirvana. The Archers of Bhutan, explores the deep-seated cultural and historical importance the sport has achieved in that tiny nation, and the ironic and repeated Olympic disappointments it has suffered. Beyond the Sky and the Earth (buy) - a novel by Jamie Zeppa telling the true story of a young Canadian's (Jamie) experiences teaching at schools in Bhutan - very entertaining and informative. The Raven Crown (buy) A book by Michael Aris about the origins of the Buddhist monarchy in Bhutan. The Circle of Karma - an excellent novel by acclaimed local author Kunzang Choden - insights into the life of Bhutanese women. Kuensel . A partially government owned newspaper with a forty year history. Kuensel is published daily. The Bhutanese . A private newspaper published twice weekly. Gaining popularity due to its bold statements and controversial articles and news coverage. The Bhutan Times An independent source of news on Bhutan - commercial and somewhat tabloid in nature. BT is published once a week on Sunday. The Bhutan Observer . An independent source of news on Bhutan - a social leaning paper with in-depth stories. BO is published once a week on Friday. Radio Valley Bhutan's first Private FM Radio Station. A program called "With Love From Home" can be listened online. Kuzoo FM  An English language radio channel - mixture of youth orientated music and discussion programs - FM 105. While Bhutanese villages are generally very picturesque, the towns are characterized by their concrete, utilitarian structures - notable exceptions are Trashiyangtse and Trashigang. Jakar (Bumthang) - An administrative town in the north and the birthplace of Buddhism in Bhutan. Punakha - A former winter capital of Bhutan. It still hosts the monastic body in winter. Phuentsholing - A town on the Indian border. The point of entry for travelers arriving by bus from West Bengal. Samdrup Jongkhar - An administrative town in the southeast. It is the point of entry for travelers arriving from [Assam]. Official [website of National Parks and Protected Areas in Bhutan. Bhutan is a unique destination, and as such it has a few unique rules. All tourists, except for citizens of Bangladesh, India and the Maldives, must obtain a visa before arriving in Bhutan. All tourists must book their travel through a local licensed tour operator (or international partner). Visas are applied for online by your local tour operator and it is not required that you visit a Bhutanese Embassy or consulate. Your holiday must be paid in full, via a wire transfer, to the Tourism Council of Bhutan account before a tourist visa is issued. The money remains with the Tourism Council until your travel in-country is complete before the local tour operator is paid. Visa clearance takes no longer than 72 hours, once full payment has been received. At your point of entry, the visa will be stamped in your passport on payment of USD40, also prepaid through your tour agent. Visa extensions can be obtained through your local tour operator at a cost of Nu.600 (1 Ngultrum = 1 Indian Rupee) and the tourist will also be subject to the daily tariff for the additional days. As travel to Bhutan almost invariably requires at least one flight change in Bangladesh, India, Nepal, Singapore or Thailand, ensure that you meet the visa requirements of those countries before transiting through. Nepal and Thailand offer visas on arrival or visa waiver for many nationalities. India generally requires visas for most nationalities, though 50 nationalities can obtain an electronic visa online without having to send their passports or visiting an embassy. Check your local Indian embassy/consulate for details. The total cost for a Bhutanese visa is $250 a day during tourist high season, and $200 a day for low season. This includes basic accommodation, transportation, meals, plenty of bottled water and special entry fees. Discounts apply for minors and larger groups, while surcharges exist for groups smaller than 3. Surcharges also exist for upgrading hotels, transportation, and meals. The only exceptions for having to book a tour as a condition for being allowed to visit are for those who receive a formal invitation to Bhutan from "a citizen of some standing" or a volunteer organisation, and those who come as guests of the Bhutanese government. 1. Travel time from Bagdogra Airport to Jaigaon/Phuentsholing by road is around 5-6 hours depending on traffic jams. 2. No permit is required for entering Phuentsholing. However the entry gate from India closes at 20:30 (IST). Bhutan time is half hour ahead of Indian time. You can stay in hotels in Phuentsholing without permit. Permit is made at Phuentsholing for onward visit to Thimphu and Paro only. For visiting other places in Bhutan like Punakha or Bumthang, permit is made at Thimphu. 3. Staying in Jaigaon is cheaper, and availability is not an issue during off season. 5. Indians can withdraw Bhutanese currency using their Indian debit card at a charge of INR20 per transaction. 6. Indian currency is widely accepted. 7. Travel time from Phuentsholing to Thimpu is around 7 hours by road. 8. The road is mostly mountainous, and must be avoided by those with fear of heights. WHAT IS ENTRY PERMIT ? Regional tourist entering Bhutan via Road are asked to obtain a Entry permit and are asked to produce it in every check posts in Bhutan. Entry permits are obtained from the Immigration office in Phuntsholing. The immigration office is open from 9 Am till 4 Pm of weekdays and closed on Saturdays, Sundays and public holidays. Lunch hours are from 1 PM to 2 PM BST. BST is 30 minutes ahead of IST. ENTRY POINTS IN BHUTAN There are 3 points to enter into Bhutan via Land. Passport copy/Voter ID card + 2 Photographs (Please carry originals also for verification). For children below 18 years without valid passport, Birth Certificates and valid school ID are required to get Entry Permit. (Both are required in case of school going kid). Produce a Hotel Confirmation voucher at the counter. This is to make sure that all tourists visiting Bhutan has a proper address. So book a hotel prior to your arrival and have your hotel send you a confirmation voucher before entering Bhutan. The Entry permit granted by immigration officials in Phuntsholing is valid for travelling in Thimphu and Paro only. Once you arrive in Thimphu, you need to apply for Special area permit to visit any places other than Thimphu and Paro such as Punakha. Once you arrive in Thimphu, take a photocopy of your route permit to the Immigration office in Thimphu and process for the Special area permit. You need to fill up another form and attached your route permit along with it. You can collect your extension permits from the same office after 1 hour. If you are driving your own vehicle, you need to avail the Extension Permit from RSTA (Road safety and transport authority) located next to Lutenzampa School/bus parking. ADVANCE ONLINE PERMIT An online permit can be availed for entering into Bhutan. You need to book a minimum 3 star hotel, and your tour should be accompanied by a tour guide. You need to book your trip with a local tour operator in Bhutan. Have your tour operator avail an online permit for you before your trip. The online permit also mandates you to have a Passport with minimum validity of 6 months before exact date of travel. Voter cards/ adhar cards are not accepted. PROCEDURE FOR OBTAINING THE ENTRY PERMIT Usually it takes around 30 minutes to get all formalities done and get your permit. You need to fill in a form, attach your photographs and submit at first counter. Your name will be called at the next counter, once your name is called at next counter, you need to reach there to get your picture clicked and provide finger prints. You can collect your Entry Permit from third counter stamped and signed. It may take longer time on Mondays as office remains closed on weekends. VALIDITY OF THE PERMIT Entry Permit and Special area permit is valid for a maximum of 7 days and if you want to spend more time than 7 days, you need to visit the Immigration office in Thimphu again and apply for extension of stay. Documents required for extension: A copy of Original Entry Permit, 1 photograph. PENALTIES FOR NOT OBTAINING PERMIT. There are immigration check posts at all routes and it is traveler’s responsibility to get his entry and extension passes stamped both during entry and return. In case you miss getting your pass stamped, there is a hefty fine (on daily basis) and also the chances that your permits may be confiscated by authorities. So, please do make sure to stop at all these check points both at entry and exit. FEE FOR OBTAINING PERMITS There is absolutely no cost for obtaining the entry permits, special area permits or vehicle permits unless you hire a local agent to avoid going through the hassle yourself. KEEP YOUR PERMITS ALONG WITH YOU THROUGHOUT YOUR TRIP. You permit is an important document while you are in Bhutan and you must keep it along with you at all times. It is checked at various immigration points while travelling between cities and also to enter in all key Dzongs and Monasteries including Paro, Punakha & Thimphu Dzongs and Tiger’s Nest Monastery. DISPOSAL OF PERMIT Towards the end of the trip, you need to submit the Entry Permits and extensions at last immigration point during exit. Paro International Airport (PBH/VQPR) is the only entry point to Bhutan by air. It is located in the south west of the country and served by the country's flag carrier Druk Air  and by the private airlines Bhutan Airlines . While Druk Air uses since April 1st 2008, Bhutan Airlines has both e-tickets and paper tickets depending on the route. Druk operates five aircraft (four Airbus A319s and an ATR-42, and an Airbus A320 on order) which fly routes to Bangkok in Thailand; Delhi, Kolkata, Bodhgaya/ Gaya, Bagdogra, Guwahati, and Mumbai in India; Kathmandu in Nepal; Dhaka in Bangladesh, and Singapore. Bhutan Airlines operates three Airbus A319s and flies to a variety of locations in India, Bangladesh, and Thailand. Routes are updated constantly and times change depending on the season. Check out the current flight schedule for Bhutan Airlines There are two domestic airports. Yongphulla Airport is located in Trashigang in the east and Bathpalathang Airport is located at Jakar in the Bumthang district. From the latter part of 2012 the domestic Gelephu Airport will go into operation. (This airport is completed but is not consistently in operation for tourist flights. It is located in the southern central region, close to the Indian border. . Airline schedules change at least twice per year. Check the respective airline's website for current schedule. Be aware flights to Bhutan and within Bhutan are not cheap. Budget about US$1 per mile. Bagdogra Airport (IXB) . Serving the city of Siliguri in the neighboring Indian state of West Bengal, Bagdogra is a four hour drive from the Bhutanese border town of Phuentsholing. Bagdogra receives frequent flights from major cities within India, and Druk Air operates flights from Bangkok on Sundays and Wednesdays (with out going flights on Tuesdays and Saturdays). From Kolkata: The Royal Bhutanese Government runs a service to Phuentsholing. These buses depart from Kolkata's Esplanade bus station at 7PM on Tuesday, Thursday and Saturday and from the Phuentsholing Bhutan Post office at 3PM on Monday, Wednesday and Friday. The journey takes around 18 hours and costs 300Rps/Nu. The buses are comfortable, which is also complemented by the excellent highway connectivity to Kolkata. From Siliguri: There is frequent service between Siliguri and Phuentsholing/Jaigaon. It is roughly a four hour journey. Buses operated by Royal Bhutan Government depart from across the main highway from the bus station, near Heritage Hotel, at 7:30AM and 1:30PM daily. Tickets cost Rs 62 and are available on entering the bus. From Phuentsholing: There are private buses and shared taxis from Phuentsholing to Thimphu but a comfortable option is to book a Bhutan Post bus (Rs/Nu 170) which leaves each morning at 7 AM (Bhutan time) from the post office. New Jalpaiguri Station (NJP) in Siliguri is a popular choice for travellers heading to Bhutan by land. There are direct shared taxis from NJP to Jaigaon or there is the option of buses from Siliguri bus station. A taxi between the station and the bus station costs around 80rs max. Alternatively you can also take a local train to Hasimara which costs around Rs40 and takes around 3 hours. Trains from NJP should be booked ahead, as it is a popular stations amongst locals. There are not any trains leaving from this station with a tourist quota. 'New Alipurduar' (NOQ) railway station is a better option than New Jalpaiguri if you want to reduce your road journey to Jaigaon. From here, Jaigaon is only about 60 kms and can be covered in about 1 hour 15 minutes by a direct taxi. Alternatively, bus services from New Alipur Duar town to Jaigaon are also available. Most of the trains going to Guwahati stop at this railway station. It is also shorter route for those coming from Guwahati or other north-eastern states of India. There is a Tour Cost Calculator that takes into account all the fare rules and calculates the total cost of a trip to Bhutan. It is illegal to undercut tariff prices and tour operators found to be undercutting have their licensed terminated. The only other options for visiting the country are to receive an invitation by a Bhutanese citizen, where proof of the relationship must be presented on applying or through a NGO. The royalty, which is included in the daily tariff, is the Tourism Council of Bhutan sustainable tourism policy fee. This royalty of USD $65 goes directly to the government to provide free education and healthcare, as well as poverty alleviation. Prior to your trip to Bhutan you will be asked to wire the full payment for your holiday to the Tourism Council of Bhutan account. A tourist visa will not be issued until full payment is made prior to departure. This money will remain with the Tourism Council of Bhutan until your trip is complete. Only after you have completed your holiday will the money be transferred to the local tour operator with which you booked your travel through. If you are not satisfied with the service you received while on your holiday to Bhutan, you can contact the Tourism Council of Bhutan who will assist. Alternatively, MyBhutan is the only platform that allows you to submit payment via credit card or ACH online. Endorsed by the government, the industry-wide services website expedites the trip planning process and handles all administrative tasks -- all provided at the government minimum tariff. In the case of persons from India, Bangladesh and Maldives only, visas are issued on entry. A photograph and Identification document, Passport or Voter ID Card, is required (along with a photocopy of either). Fill the document with purpose "Tourism". At land border crossings you will only get 7 days for Paro and Thimphu. For extension of duration apply in Thimphu at the Immigration office at the northern end of Norzin Lam. For visiting other districts you will need to apply for road permits at the same office. They are best applied in the morning and you will receive the document in the afternoon. In case you are defence official without a passport or a student without the above three accepted identification papers, you can request the Indian consulate further up the road to provide you an identification endorsement document but this takes time. The national speed limit is 50 Km per hour. Don't expect to average more than 30 Km per hour. The majority of tourists do "cultural tours" where they visit important destinations. Paro, Thimphu, Punakha, Wangdue, and Jakar are popular destinations. Further afield, the unexplored region of Zhemgang (birders paradise, excellent wildlife viewing) and Eastern Bhutan have just been opened up to tourism. If you are an adventurist and want to explore the unexplored the east of Bhutan is the place for you. This unique and yet untouched part of the country offers the ultimate experience. Taktsang Monastery (Tiger's Nest), Paro. This is one of the most important Buddhist sites in the world, and Guru Rinpoche visited here in the 8th century on his second visit to Bhutan. It is the most recognized and visited monument in Bhutan. It is believed that he arrived on the back of a winged tigress, hence the name, Tigers Nest. The temple is built on a 1,200 meter cliff and was built in 1692. The hike up to the Tiger's Nest can be very strenuous and you can rent a horse to bring up the mountain, only to the half way point, for about USD $10. The horse ride is a one-way trip (this is recommended if you are not very fit and may face altitude sickness) and you have to make your way down the mountain by foot. Start at 8000' climb to 11,000' and descend to 10,000' to reach Taktsang. Oxygen, or lack of, is the challenge for sea level dwellers. For independent travelers, taxis can be arranged to reach Taktsang Monastery. As on May, 2014, a reserved small car will cost you Nu 500 for a round trip and takes about 20 minutes one way. The car will drop you at the site and then will come to pick you up at a later fixed time. You can visit Kyichu Lhakhang Monastery on your way to Taktsang. Tashichho Dzong is a Buddhist monastery and fortress on the northern edge of the city of Thimpu in Bhutan, on the western bank of the Wang Chu. It has traditionally been the seat of the Druk Desi (or "Dharma Raja"), the head of Bhutan's civil government, an office which has been combined with the kingship since the creation of the monarchy in 1907, and summer capital of the country. The main structure of the whitewashed building is two-storied with three-storied towers at each of the four corners topped by triple-tiered golden roofs. There is also a large central tower or utse. Built in 1216, Semtokha Dzong in the Thimphu Valley was the first dzong built in the country. Trekking is also extremely popular. The Druk path is the most commonly trekked from Paro, to the capital Thimphu. However, many other more impressive treks are available, see the complete list below. The Jomolhari, and Laya Gasa trek are also very popular and the Snowman Trek is reported to be one of the toughest treks in the world, taking a approximately 30 days. The recommended season for this trek is mid-June to mid-October. Bhutan pristine environment offers ecosystem which are rich and diverse, due to its location and great geographical and climatic variations, Bhutan’s high, rugged mountains and valleys boast spectacular biodiversity, earning it a name as one of the world’s ten most important biodiversity hotspots. Recognizing the importance of environment, conservation of its rich biodiversity is one of its development paradigms. The government has decreed that 60% of its forest resources will be maintained for all time through a recently enacted law passed by government. Today, approximately 72% of the total land area is under forest cover and about 26% of the land area fall under protected areas comprising of four parks. As a result, Bhutan offers a wonderful raw and unexploited environment that is generally very much appreciated by international travelers. 35% of Bhutan is made up of protected national parks. Namely, Jigme Singye Wangchuck National Park (1,300 sq.km), TrumshingLa National Park (768 sq. km), Royal Manas National Park (9,938.54 sq. km), Jigme Dorji National Park (4,349 sq. km), Bumdeling Wildlife Sanctuary (1,545 sq. km) and Sakteng Wildlife Sanctuary (650 sq. km). Trekking: Bhutan is a popular place for trekking, though the walks are generally quite tough as there are no places to stay or eat in the higher regions, and so all food and camping equipment must be carried in. The autumn and spring are the best seasons for undertaking a trek. In the summer, the paths are too muddy, while in winter they are snow covered. However, despite the difficulties of the treks, all efforts and discomforts are more than compensated for by the stunning scenery and extremely friendly, gentle and hospitable people that are met along the way. See: Wilderness backpacking. Hot Stone Bath: The hot stone bath is a ritual in itself, riverside rocks are heated till red hot and gradually dropped into a wooden tub filled with water and scattered with Artemisia leaves. The burning rocks heats the water gradually and thus release minerals in to the water. Traditionally these bath are done near a river bed with plenty supplies of stones and water and preferably after dark in the open air. Visit and discussion with young Buddhist monks, a Buddhist astrology reading, hike to a secluded nunnery, archery demonstrations, and lunches and cooking demos at local farmhouses can be arranged by special permission only. As an international tour operator with a long-term relationship with a Bhutan partner, Boundless Journeys is able to arrange these things and more for their guests and has personally vetted the hotels, guides, and activities on their Bhutan tours. They take care of the internal flights into the country as well as the visas. The official language and lingua franca of Bhutan is Dzongkha - a Sino-Tibetan language which is written in the Tibetan script. Dzongkha is the main language spoken in Western Bhutan, with nearly two-dozen other Sino-Tibetan languages being spoken across the country, including Sharchopkha in the east and Bumthangkha in Bhumthang. Most Bhutanese can also speak Nepali, which is the native language of most Bhutanese who reside in the south of the country. Owing to the presence of Indian media and trade, most people in urban areas also understand English and/or Hindi. The official currency is the ngultrum (Nu. ), which is pegged 1:1 with the Indian rupee (₹). However, the ₹500 and ₹1000 notes are technically banned by the Bhutanese government, although many local non-governmental establishments accept the ₹500 note. The restrictions on exporting Indian rupees were lifted in 2014 - all nationals may bring an unlimited amount of currency into Bhutan. US dollars ($) are widely accepted. Bhutanese currency is only needed for expenses personal in nature and buying small souvenir items. Most ATMs in Bhutan - which are mostly concentrated in Thimphu and Paro - are now compatible with international credit cards such as VISA, MasterCard and Maestro. However, as the service it is not overly reliable, it is good practice to have a supply of ngultrum, rupee or dollar notes. Failing everything else, banks and major hotels will exchange US dollars for ngultrum and vice versa. Remember to keep your bank exchange receipt to get back dollars. Yathra. A brightly coloured woven material made from wool and dyed with natural colours. It is sold in pieces or sewn into jackets, bags, rugs and wall hangings. Yathra is available in Thimphu and other cold areas, but is a specialty of the Jakar area. Bhutanese food has one predominant flavour - chili. This small red condiment is not only added to every dish but is also often eaten raw since chillies are considered a vegetable. So, if you don't like spicy-hot food, make this abundantly clear before ordering a meal. Otherwise, you'll be spending the next hour dousing your mouth with cold yogurt or milk. Hot-pot and Western European food is now available in some restaurants in Thimphu where French fries, pork or beef ribs, pizza... are served. Ema-datsi. Ema means chili and datsi is a kind of cottage cheese, so ema-datsi is a kind of spiced-up Welsh rarebit. Imtrat run canteens that sell excellent Indian dishes along with tea from 09:30to 16:30. The quality of the food is very good, while the price is low. The canteens are located throughout the country, especially along main highways. Good Indian vegetarian food in Thimphu is available in few pure vegetarian restaurants located on Norzin Lam, the main street in centre of city. Prices are reasonable. Ara. A local spirit brewed from rice or corn. It is popular in rural areas. Tea. Located next to the tea growing regions of Assam and Darjeeling, a steaming cuppa remains the popular drink in Bhutan, with both the butter variety (suja) and sweet milk kind (ngaja) readily available throughout the country. Coffee. The coffee culture that has swept most of the planet is just beginning to creep into the country. However, for the most part, coffee in Bhutan means the instant variety and it is served simply white or black. Beer. A local raw fresh beer brand name "Red Panda" which is the most fresh and good for tasting. It is important to note that the hotel rates shown on the city articles are only relevant to people who have residency, visa exemption (generally this only applies to Indian nationals) or who are visiting the country as an invited guest. Other visitors can only enter the country as part of a tour, for which the daily rates are set by the Bhutanese authorities at around $250 per person per night irrespective of the hotel rates (except for very expensive hotels where a surcharge is added). Deer Park Thimphu  holds various Dharma related events in the capital, including weekly meditation sessions. Products containing tobacco (cigarettes, chewing tobacco, etc) are effectively banned throughout Bhutan (which remains the only country in the world to do so) and penalties for possession or use may be severe. One can bring in 200 sticks of cigarettes after paying customs duty at the airport or land entry ports. See Customs and Duty Free. Homosexuality is illegal with a penalty of one month to one year, but the law is unenforced. Bhutan has a universal health care system - hospitals and clinics are located throughout the country, even in the remotest areas. However, travellers should not expect hi-tech facilities, and at many of the Basic Health Units the resident doctor is often away. Waterborne diseases such as diarrhea, dysentery, giardia and even typhoid are not uncommon in Bhutan, especially during the summer monsoon season. Therefore, ensure that all water has been thoroughly boiled or otherwise purified before consuming. The king and former king are accorded a great deal of respect in Bhutan, as is Vajrayana Buddhism - the state religion. It is wise to bear this in mind when conversing with local people. Clothing. When visiting temples, remove shoes and head gear and wear clothing that expresses respect for the sacred nature of the site. You will need to wear pants and long skirts. Tobacco. Products containing tobacco (cigarettes, chewing tobacco etc) are effectively banned throughout Bhutan (which remains the only country in the world to do so) and penalties for possession or use may be severe. Bangkok: Royal Bhutanese Embassy in Bangkok - 375/1 Soi Ratchadanivej, Pracha – Uthit Road, Samsen nod, Huay Kwang, Bangkok 10320. Tel: +66-2-2744740, Fax: +66-2-2744743. U.S.: Permanent Mission of the Kingdom of Bhutan to the UN, - 763 United Nations (1st Avenue), New York NY 10017. Tel: +212 682-2268, Fax: +212-661-0551. Mumbai - Druk Air (Royal Bhutan Airlines) seasonal flights since 2014. Dhaka - Druk Air flies between Dhaka, Bangladesh and Paro 4 times a week. Kolkata - Druk Air flies between Paro and Kolkata. In addition, the Bhutan Government operates an overnight bus service from Phuentsholing on Monday, Wednesday and Friday. The buses depart from Bhutan Post office at 3 p.m., and the journey takes around 18 hours and costs 300 Rps/Nu. New Delhi - Druk Air flies between Paro and Delhi. It also operates flights between other Indian cities of Guwahati, Gaya and Siliguri (Bagdogra Airport). Singapore - Druk Air flies from Paro to Singapore (with a stopover in Kolkata) on Mondays, Wednesdays and Saturdays and return to Paro on the following day. This page was last edited on 3 March 2019, at 20:36.